MARCH 15, 2018 Practice tips, membership benefits, upcoming events, new products, and more! In recent years, digital marketing has been blowin’ up a storm. Some have thought the surge in digital advertising spelled the end of print, but that’s one theory that hasn’t proven true.1 I do declare print ads still exist and even have advantages. Print amounts to much more than a hill of beans. You can create print ads in a relatively short amount of time, and often the publication will provide design assistance free with the price of the ad. Digital marketing – especially pay-per-click advertising – requires significantly more manpower to develop the right keywords, bidding strategies, landing page quality scores, and analytics. Try integrating print advertisements with your digital campaigns to make both more effective. Print sticks around ‘til the cows come home. 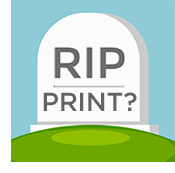 The shelf life of print publications provides tremendous value. People read magazines in reception areas, homes, and offices for months after publication. Print is pretty as a peach. Your brand can really shine in print. Using full color and bold images allows for lots of flexibility and makes your brand stand out. Heavens to Betsy, print is credible. Wisconsin Lawyer™ magazine can put the power of print to work for you. Whether you’re looking for referrals, building brand recognition, or announcing something special like firm promotions, new hires, a firm milestone, or awards, the State Bar's flagship monthly magazine gives you excellent visibility within the legal community. (800) 444-9404 ext. 6132 or org krichter wisbar wisbar krichter org for more information on special issues or upcoming editorial content. As we all know, PI is more than 3.14 - you can't forget the 159.... So to recognize the fuller extent of PI, we’re extending our 30% savings on subscriptions to the Books UnBound® online law library through today at midnight! Always accessible: Books UnBound is with you anywhere there’s an internet connection. It serves up information on your smartphone or laptop in the courtroom, home office, or wherever else you need it. Straight to the source: Bring your investigations full circle with Books UnBound. References to case law and statutes link directly to the original sources in Fastcase at no additional cost. Scores of useful features: Experience a slice of research heaven with keyword search and bookmarking options. Plus, download up-to-date, fillable forms with a simple mouse click. *The pie is all gone at midnight Thursday, March 15. The 30% discount is not available with any other discount. It may not be applied to previous purchases, individual Books UnBound titles, Books UnBound firm subscriptions, or existing Books UnBound subscription renewals. Stop! Have You Sponsored AMC 2018 Yet? The Annual Meeting & Conference is one of the Bar’s most anticipated events – but we can’t make it happen without your help. There’s still time to become an event sponsor. Support AMC and the legal profession by becoming a sponsor. To learn more, contact Karen Richter at org krichter wisbar wisbar krichter org or (800) 444-9404, ext. 6132. Acting on court orders, doctors removed the feeding tube that was keeping Terri Schiavo alive. She died 13 days later. Her husband and parents clashed over her care for years after she collapsed in 1990 from a cardiac arrest that left her brain deprived of oxygen. Her case sparked an unprecedented legal battle, with Congress, the White House, and federal courts weighing in on her condition. It also shined a spotlight on the need for living wills/advance directives. National Health Care Decisions Day week is coming up April 16-22. Make sure your clients are prepared with A Gift to Your Family: Planning Ahead for Future Healthcare Needs. These helpful booklets walk clients through the process of putting their wishes in writing and direct them to seek attorney counsel for answers and planning advice. Versions are available in English for Illinois, Minnesota, and Wisconsin. The Wisconsin version also comes in Spanish. The Government Lawyers Division and the Administrative and Local Government Law Section are co-producing the Current Issues in Land Use and Development PINNACLE CLE session. When your clients look to you for counsel on the legalities of land, you’ll be ready with the helpful guidance from this valuable program. It examines the laws governing key housing situations, cell towers, TIFs, homeowners associations, and more. Register today. Child Advocates: Learn at Lambeau! Whether you’re a judge, court commissioner, prosecutor, guardian ad litem, agency attorney, or in private practice, this unique program hosted by the Children and Family Law Section has the legal playbook you need. Come out of the huddle with practical advice on hot topics and timely guidance on today’s trends. Get in the game and register now for this special CLE program held in Green Bay at the Lambeau Field Club rooms. Are you a section member looking to do more for your section? Thinking of joining a section? Running for a board position or serving on a subcommittee are great ways to become more involved. Section volunteers make an impact on the legal profession and justice system by providing vital services to State Bar members and the public. It’s also a meaningful way to meet and work with fellow attorneys who share your interests, needs, and concerns. During the next few months, the State Bar’s sections will be asking for board nominees and subcommittee volunteers. Please consider contributing your time and expertise. For questions, contact a section board member. Even if you’re unable to volunteer this time around, be sure to vote in your section’s elections. Watch your email for more information. *This offer is not available with any other discounts and expires at midnight March 16, 2018. Discount applies to first time purchases/subscriptions only. It cannot be applied to previous purchases, auto-supplementation orders, or Books UnBound subscription renewals.